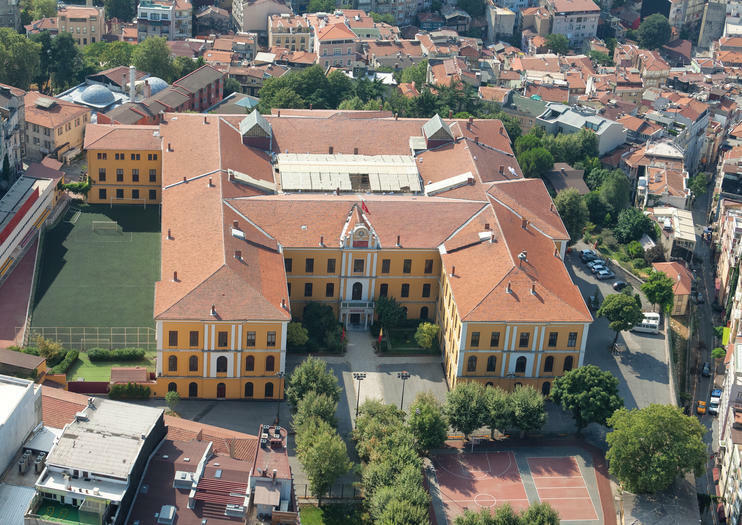 Founded in the 15th century as an imperial palace school, Galatasaray High School (Galatasaray Lisesi) continues to be Turkey’s most prestigious school. The curriculum is drawn from the French lycée model, and classes are taught in both Turkish and French. The ornate gate at the center of Istiklal Street is a popular meeting spot. Galatasaray served as an imperial palace school until 1830. Its long list of notable alumni include doctors, academics, artists, poets, and soccer players. As a boarding school, the highly selective high school attracts students from all over Turkey. In addition to their classes in French and Turkish, students also learn English and Italian. Walking tours of the Istiklal area often pass by Galatasaray High School. Tours usually also include visits to Galata Mevlevi (Galata Mevlevihanesi), Taksim Square, SALT Galata, and the Istanbul Modern. Galatasaray is of particular to those interested in academics and history. Galatasaray High School is an active campus and you need to present an ID to enter. Often demonstrations happen around the gate to the high school. Galatasaray is located on Istiklal Street in Beyoglu. The historical tram that runs the length of Istiklal Street connects Galatasaray to Taksim and Tunel squares, which are both major transportation hubs (and accessible by metro) and are connected to the main tram line by funiculars. Taxis are abundant in Taksim Square. As both a rendezvous point and active school, Galatasaray is always busy. It’s not unusual to see people hanging around the main gate at all hours of the day. The school is easiest to visit from the outside, as the school has the requisite security. In Turkey, Galatasaray is synonymous not just with the high school, but with the popular soccer club. The Galatasaray S. K. began as the high school’s soccer club in 1905. Over the last century, Galatasaray has grown to become one of the most popular and successful clubs in the country. Dive headfirst into Istanbul’s modern art scene on this 3.5-hour walking tour. Learn about Turkey’s rich art history as you follow your enthusiastic guide around the districts of Tophane and Karaköy, stopping to browse a selection of the city’s most interesting contemporary art galleries, including SALT Galata. Finally, learn about popular Turkish artists like Abidin Dino and Ara Güler, and view cutting-edge temporary exhibitions at the Istanbul Modern Art Museum. This small-group tour is limited to 15 for a personalized experience and includes hotel pickup. Immerse yourself in Istanbul’s diverse religious communities with a private, 4-hour Sunday walking tour that takes in some of Turkey’s traditions and places of worship. Trace a route from an Armenian Gregorian church to a Sufi Mevlevi house, see a Sephardic synagogue and explore Ottoman-era mosques. Learn about the customs and practices of each group, and get a glimpse of the city’s vibrant mosaic of beliefs. Following the tour, you’ll have the option to attend a moving Sufi ceremony at Galata Mevlevihanesi.